Thanks for posting this on your own site – glad you enjoyed it! I enjoyed the post and I agree with you that the “just jump in and start swimming” method of novel-writing is for amateurs who want to remain amateurs. Thanks, I’m glad you enjoyed it. Yes indeed, of course everyone works in different ways but I certainly believe that knowing where you are headed makes for a tighter read and saves the writer time on edits too! So much good sense – as always! The ‘ahh!’ is so important! There have been loads of books I’ve felt like that about – just a few off the top of my head, The Ballad of The Sad Café by Carson McCullers, The Pursuit of Love/Love in a Cold Climate by Nancy Mitford, A Chance to Sit Down by Meredith Daneman (a now out-of-print book from the 1970s about a ballet dancer) and of course Slick Deals and each of the Lavender Road trilogy. I think it’s interesting when writers create a trilogy – I’ve read the first instalment of The Hunger Games and am moving onto the second. Makes me aware of how much work the writer has to do ‘setting up’ subsequent books for readers who might not have read earlier ones or read them some time ago – and to find not just one ‘aah’ book ending, but 3! 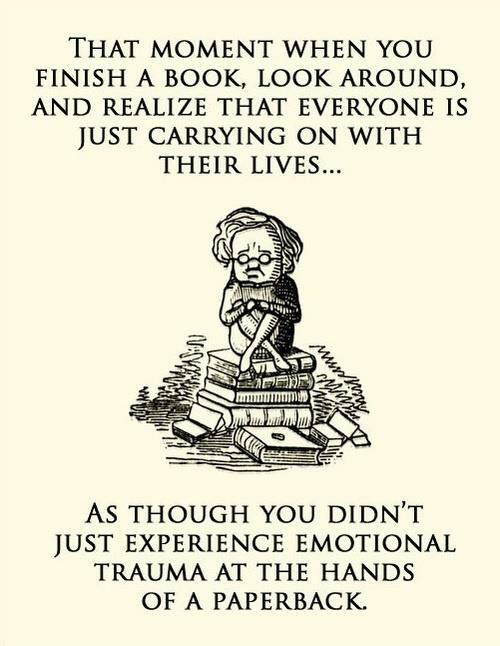 And the first two have the job of not only making the reader go ‘aah’, but also make them go on to read the next book! How do you do it? Thanks for this and for kind words about my novels too! Yes, setting up the ending for s follow on is another skill, plus, as you say, making the opening of next in series is tricky too. It needs to be clear for new readers at the same time as not being boring for people who have read the previous novel – I can see another blog post coming up!! I heartily agree about starting with a plan. I can never finish any project without knowing the end before I start, or at least having some rough plan in place. And you make an excellent point about the importance of endings. That *is* the part the reader remembers afterwards. Nice post. Thanks, and for reinforcing my points, it sounds as though we are singing from the same hymn sheet!! Mmmmm, just getting to this bit – ‘the ending’. Quite impressed that I’ve got remotely near to an ‘end’ at all! Couple thousand words more then that’s ‘it’. Just got to get it as good as I can….. wish me luck! Congratulations! I hope this is the ending you have been aiming for from the start?! Good luck with it and let me know how it works out? I’m reluctant to admit just how long it has taken me to grasp that an ending should not only be emotionally satisfying (with an ahh! from the reader not an owh!) but also that the writer should know what it is right from the start. I think the journey towards that point can evolve as you write but the goal posts have to be in a place, otherwise it’s a ramble…Thanks for the post! Yes indeed, ahh much better than owh!! Well put! So glad you enjoyed post.